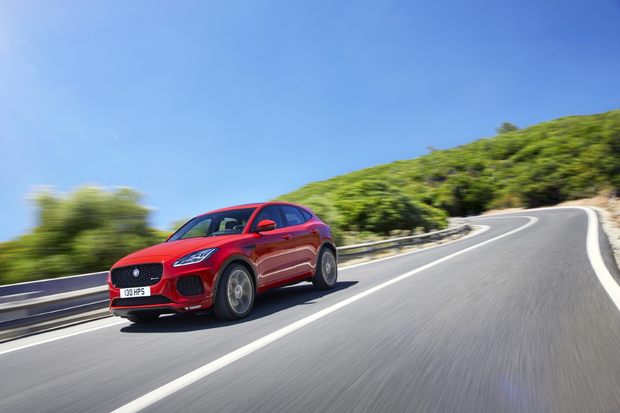 Jaguar are hoping buyers will purr over their new ‘cub’ – the baby SUV they call the E-PACE. Unveiled in London this evening, it will be on sale in Ireland from January and I expect it to start from under the €40,000 mark. That means it will be 10pc or thereabouts less expensive than the larger F-PACE crossover. It is the least expensive car Jaguar have made and opens up a whole new world for the marque – and, I suspect, for aspirant Jag buyers. Obviously it draws a lot on the big-selling (and World Car of the Year winner), F-PACE - especially in the cabin. But I think it looks better, smarter, sharper than big brother and will pose stiff competition for rivals. Because it sits below the F-PACE in size and price, the new car will have to attract a whole new profile of customer. Expect a lot of those who buy to be young and upwardly mobile. Amid glitz and glamour at London’s EXcel arena it made its global debut as it attempted a special Guinness Book of Records challenge – to complete a 15-metre long-jump with a 270degree corkscrew ‘barrel roll’. But when all the excitement abates, the E-PACE will have to make records of a different sort – with 80pc of potential buyers new to the brand. Jaguar are confident they’ll come, based on projections and the success of the F-PACE. One thing is for sure: It could hardly arrive at a better time, with growth of 23pc in its sector forecast by 2020. Premium SUVs and crossovers are simply all the rage right now. Spec and connectivity are critical areas in this brave new world and the marque is promising extensive spec across their two core models: Standard and R-Dynamic. Among standard items are the tablet-like TouchPro 10ins display, LEDs front and rear, parking sensors and rear camera. There are five USBs, one for each passenger, several charging points and a 4G hotspot can cater for eight devices. Expect a big spread of options, including 21ins allows (17ins are standard), the Activity Key from the F-PACE, a 12ins display, and the next-gen Head-Up Display technology. There are two petrol and three diesel 2-litre Ingenium engines. The 2-litre 150bhp diesel with front-wheel-drive will be popular, I think, but there is always the AWD 180PS version or the 300bhp petrol. By the way the car can tow up to 1,800kg (braked). Prices in the UK are from €28,500. I confidently expect them to start under €40,000 in Ireland. As well as core lineup there will be a specially specced First Edition – 150PS diesel or 180PS petrol. As I said, I prefer the look of the ‘cub’ to the F-PACE. It has a strong but subtler Jaguar front, lots of metal along the sides, sharply raking roof and a muscular backend. They’ve taken a lot of cues from the F-TYPE sports car. The cabin is, as you’d expect, driver orientated just like in the F-PACE. There is a gear lever rather than rotary selector as has been the case for a long time. That’s designed to give the car a sportier feel too. I like the idea. I found plenty of room for two large adults in the back seat; there are loads of cubbyholes – the central slot is capable of taking two 1-litre bottles of water. And there is a large boot – it can accommodate four conventional suit cases. The body architecture places a big emphasis on aluminium which, along with giving a strong, stiff structure also let them knock loads of kilos off the weight. Obviously as a Crossover it has plenty of off-road technology if you want it. And the low centre of gravity should boost crisp handling. Techno options include Active Driveline which aids grip, cornering, off-road and has a bias towards rear-wheel drive. Now let’s see if the ‘cub’ can set those buyer records.